First and foremost, why on earth would someone put water in their computer?! Well, there are several very good reasons. It can result in better temperatures, higher overclocks, a quieter running system and it can just plain look good. 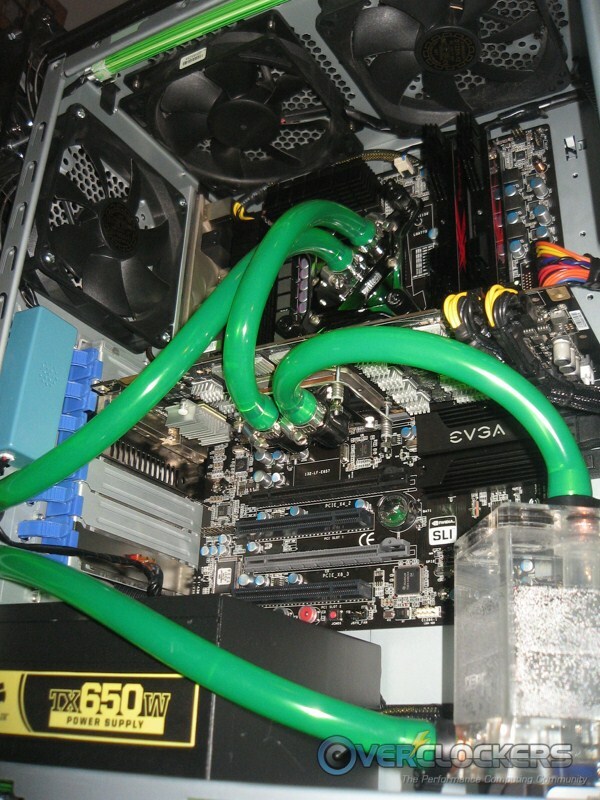 Whatever your motivation, water cooling can accomplish all of those and then some. Before you jump into this facet of our hobby, it’s always best to plan your water loop from start to finish; from the ground up – starting with the most basic of components. If you haven’t purchased your case, this is the best place to start your water loop. 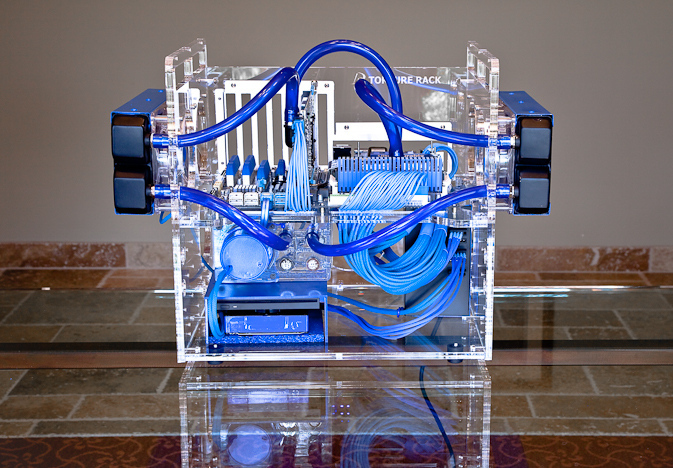 Cases can be modified to accept water cooling, but it’s much easier to have one that’s ready from the start. In very simplistic terms, there are two basic options available to you: mass produced cases and custom made-to-order cases. Mass-produced cases are what the vast majority of people will use for their setup. They can range from relatively cheap to quite expensive. These cases are pretty standard cases, usually mid-tower ATX or larger. 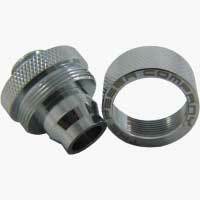 They have generally two holes for up to 5/8″ OD (Outer Diameter) tubing (some accommodate up to 7/16″OD). 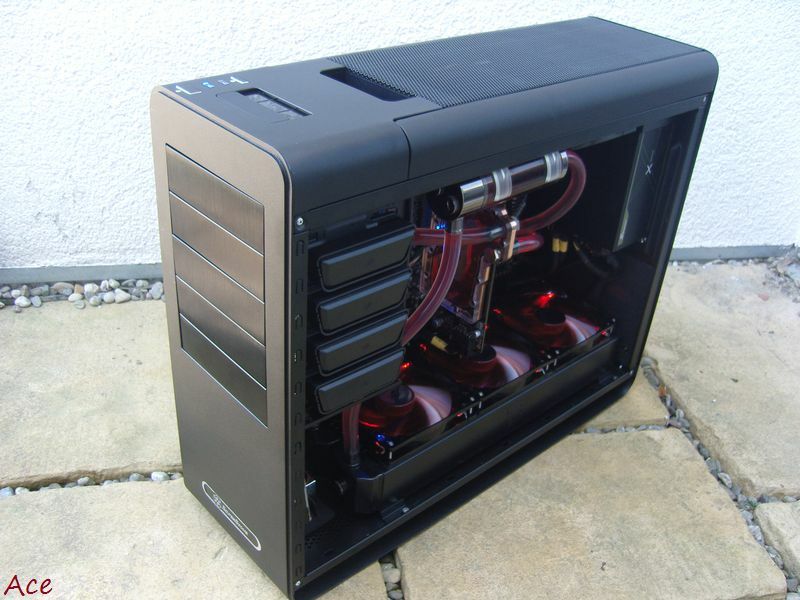 For most of them, entire water loop can usually be contained within the case except for the radiator. Some may require some inventive placement of the pump & reservoir, but as a rule all will fit inside except the radiator. 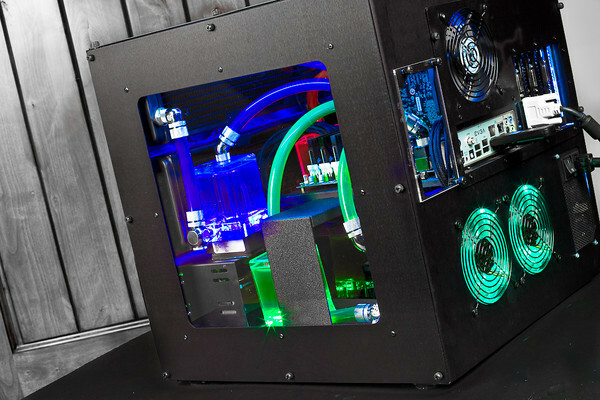 Full-tower ATX form factor cases can often fit a single radiator in addition to the tubing pass-throughs; installation is your option there. Mid-tower ATX form factor cases can sometimes fit a radiator on the inside, but it has to be on the larger end of that spectrum. 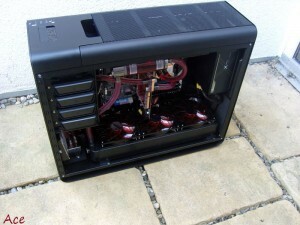 Many mid-tower cases require heavy modding to fit an internal radiator. Mid-tower cases designed to fit radiators will usually offer one or even two spaces to mount 120.2 radiators. Full-tower cases often fit either 120.2 or 120.3, with some giving the option for 140mm radiators as well. Priced from relatively inexpensive to as high as you want. A lot don’t fit an entire water loop inside (though they are becoming more and more readily available). Many require modification to accommodate full loops (mostly for the radiator – again, this is changing). No customization to order; what you see is what you get. Mass-Produced Case Example by Ace. 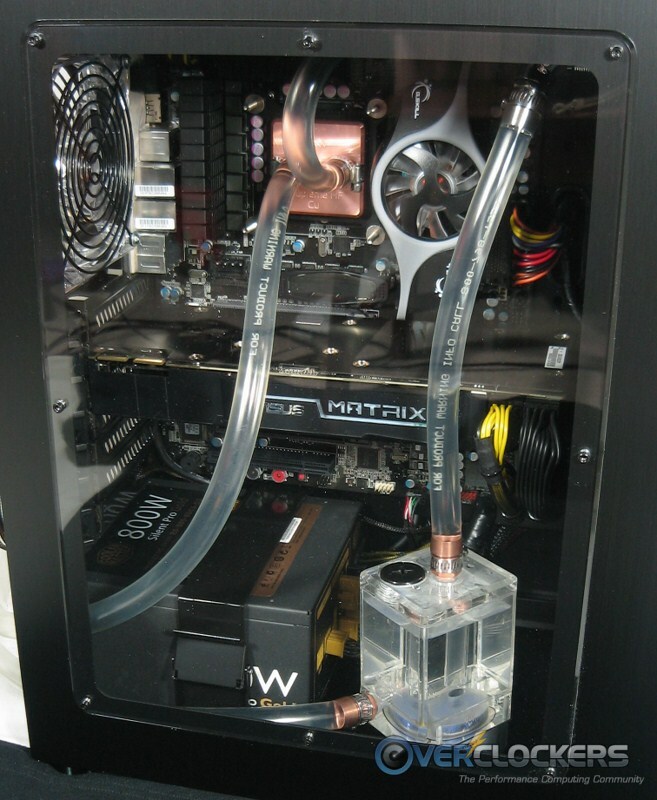 Then we come to cases made specifically for water cooling enthusiasts. In this case, the common properties are equal to the Pros. You decide what they look like. You decide the amount of cooling they can accommodate (think multiple radiators). Price, price, price. These have a very high upper limit to their cost and don’t start low. Size starts big, can get REALLY big and continue going up from there. Lack of choice. There are very few sellers of such cases. The most popular place to get such things is Mountain Mods. There are other alternatives, such as design-to-order cases from Protocase. They even give you 3D CAD software to design your own case. Alternatively, you can also have a known case builder design and build one for you. OCForums’ own Navig is a well known case designer and does excellent work. Here is one of my favorite of his creations: The Navig Exoframe, which is beautifully crafted and peerless. There are others like him (forum member Spotswood comes to mind), but these craftsmen are even more rare than actual businesses that do this. Now that you have a home for it, we’ll move on to the water loop itself. First, we’ll go over the parts one by one and then move on to assembly, testing and use later. Before going on, as you go through this guide there will be links to various products. We are by no means endorsing them, they are simply listed as examples. 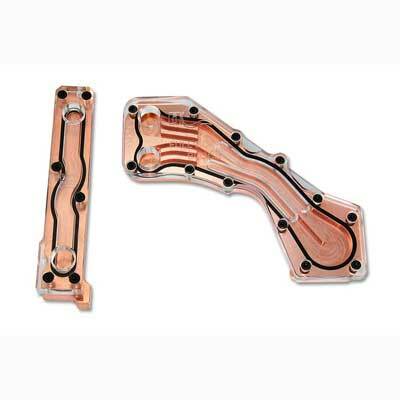 There are a plethora of water cooling parts available out there; the ones listed are just a few of the more common choices. There are also small images of them to give you an idea what they look like. The types of reservoir listed are all available, but the examples listed are by no means exhaustive. There are many options available to you. These are just examples of popular products fitting the description. 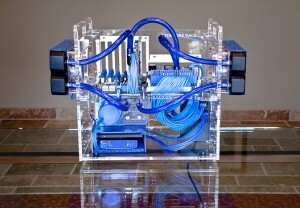 You can even crazy and go with something like one of FrozenQ’s Liquid Fusion works of art. The only “rule” for a reservoir is that it come before the pump so it will always be supplied with fluid. A dry pump is a dead pump. Another purpose reservoirs serve is to both fill and bleed the system. Bleeding a system removes the air bubbles that inevitably form as a result of filling the system. options for its location within your case. whether you want a res at all (t-line). (last but not least) purely aesthetic concerns. Most that go with the MCP350 / 355 go with a modified pump top, primarily because the original pump top is molded plastic that has permanent barbs to accommodate 3/8″ ID (Inner Diameter) tubing. 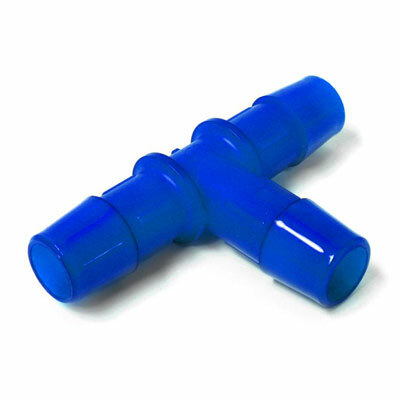 As a lot of people prefer 1/2″ or 7/16″ ID tubing, which you’d need an aftermarket top to use. Additionally, most tops will give you better gallons per hour (GPH) flow, as evidenced by this very excellent comparison. There are several other options out there, but these are the de facto standard. In the spirit of being comprehensive and for those on a very tight budget, one inexpensive alternative is the D-Tek DB-1. 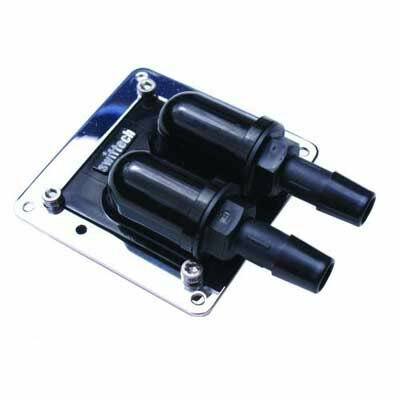 Not to leave anything out, there are also pumps available that will plug straight into a wall socket; however, the good ones tend to be prohibitively expensive except for the most ardent water cooling enthusiasts. One of the simplest combo of both of the above (and what’s in my system) is the Laing DDC3.2 / MCP355 combined with the XSPC Res top. Per that roundup, the res top gives you a pressure increase and serves your reservoir needs, all in one fell swoop. You also can’t get the liquid any closer to the pump than having the res mounted on top of it. Truth be told, any of these pumps will serve most water loops with a block or three in it. If running a high restriction loop, counterintuitively, the MCP355 would be the way to go as long as you go with a quality aftermarket top. See this graph on the D5 vs this one for the DDC. 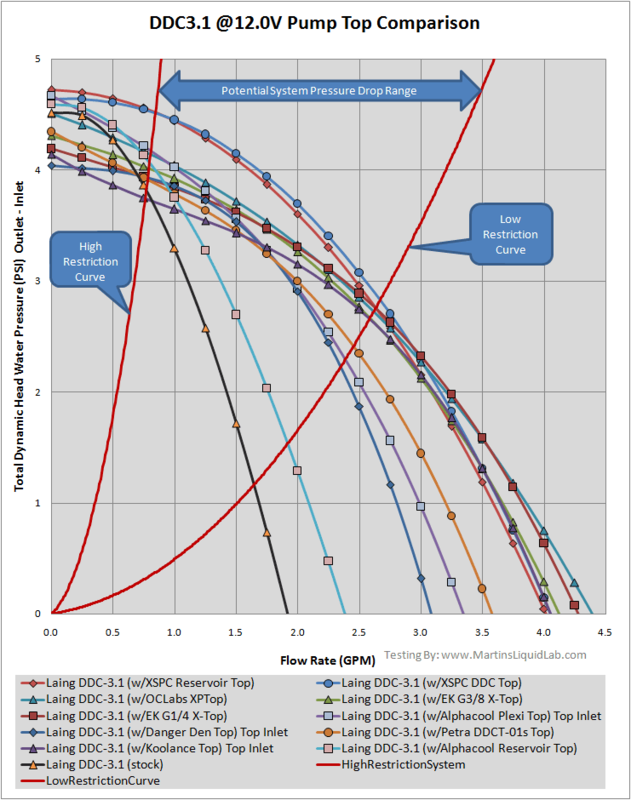 You’ll notice that per-GPH, the DDC with a good aftermarket top gives more PSI than the D5. Now, if your loop is not restrictive and you want to move mass amounts of water, the D5 is the choice for you. Water blocks. There are a lot of these out there. I’ll round up a few CPU blocks, mention a couple blocks for other stuff and move on. 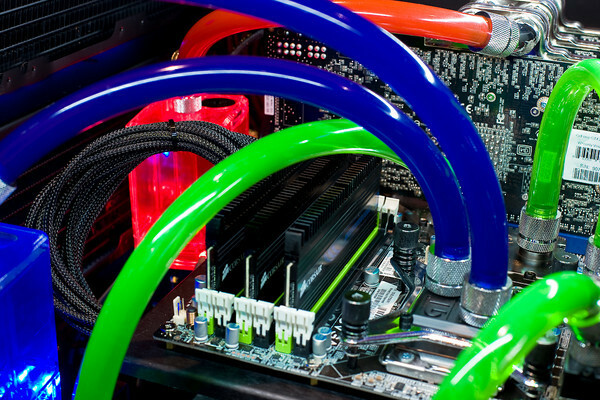 For specific recommendations, just ask away in the water cooling section. High flow / low restriction blocks tend to be better for multiple block loops. 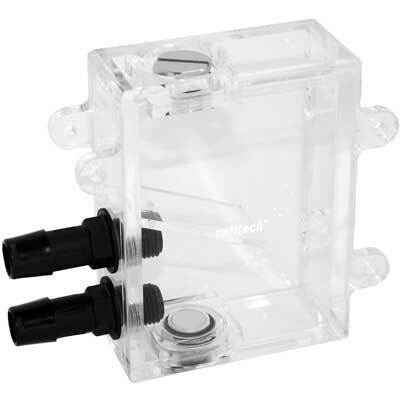 Swiftech Apogee GTZ – While listed as a low flow block, this one is the least restrictive of the low flow blocks. It’s approximately 17% more restrictive than the Fuzion v.2 (source), which is why it made this chart. Of the low flows, this is the one that has potential in a multiple block system. As they tend to be more restrictive, these blocks may be best used in their own loop without other blocks taking pressure away. In theory, what you get out of that is better temps, of course in exchange for a CPU only loop, or a multiple loop system if you want to cool more than just the CPU with water (leading to increased cost). 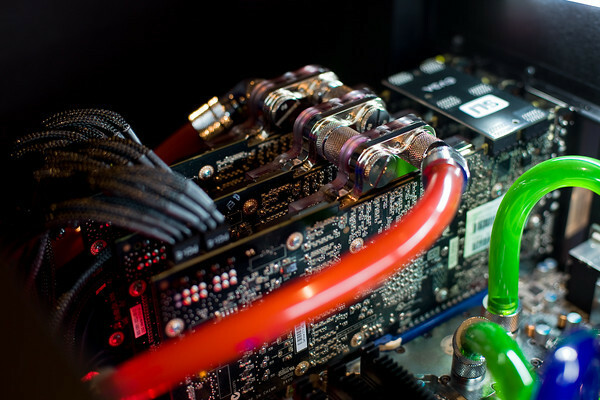 Vapor has done a remarkable job on testing a lot of water blocks on an Intel Core i7 platform. Here is the overall comparison. For much more detailed information, check out the individual block reviews. That’s a basic overview of popular CPU blocks. But why stop there? 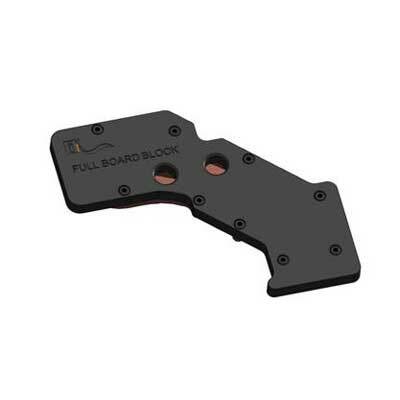 There are water blocks for almost everything. While being completely and utterly pointless (at least IMHO), there are even water blocks for RAM and HDDs (don’t waste your money). 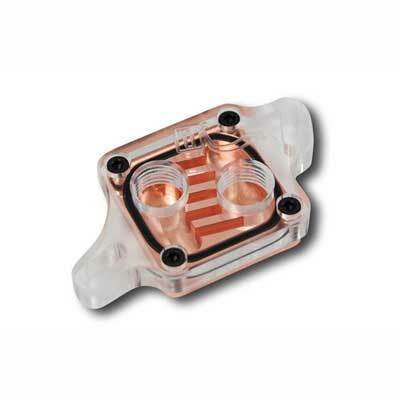 For chipset cooling, you have the option of a universal block or a block specially made for your board. Not all boards have that option. Here is a universal Danger Den NB/SB block, pulled out of the hat. There are several universal options available to you; choose whichever you like. 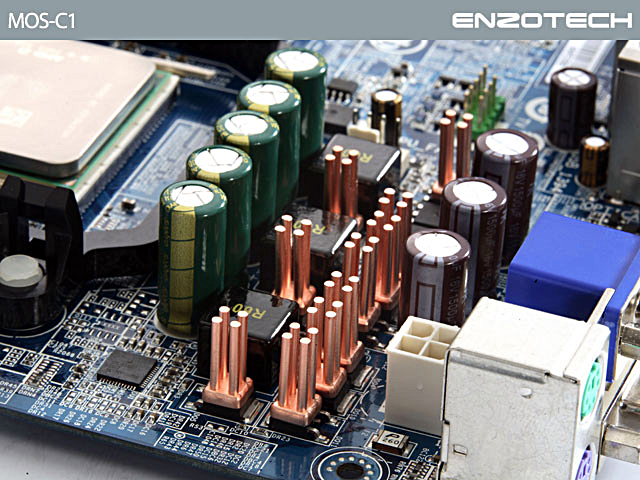 Any of them from a known manufacturer will do better than the usually passive air cooling on most boards. 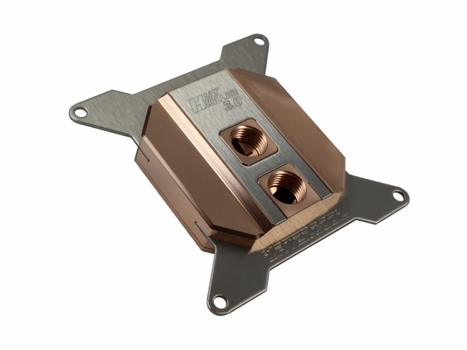 Here is an example of one of the blocks specially made for an EVGA X58 Classified. There are a couple manufacturers that produce these for various boards. They are by no means exhaustive and the recent generation seems to be mostly for ASUS and for EVGA boards. If you change motherboards often, universal will be the way to go if you wish to cool your chipset(s). Most southbridges do not get hot enough to warrant water cooling, so there really isn’t any need to add an additional block if there isn’t a specialty block available for your particular board. X58 SBs do get a bit warm but if yours does, adding a 40mm fan should fix that problem without having to go to the expense of a water block addition. On new platforms with a PCH (Platform Controller Hub; i.e. P67), these become even less relevant; you just don’t need to water cool a PCH under most circumstances. There is a rather substantial drawback to using a chipset block. Most MB manufacturers these days use a heatpipe solution on at least the NB & MOSFETs. 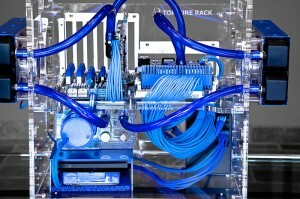 This means the stock air cooling solution are linked and inseparable. Unfortunately, if you put a water block on your chipset, it will leave the power section bare with nothing to dissipate the heat! 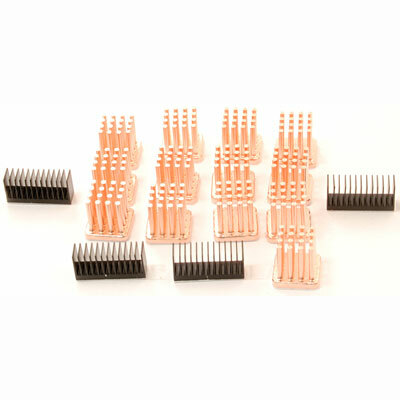 Thankfully, they make these little copper one-per-MOSFET heat sinks to help with that problem. As long as you have good case airflow in the area, these should be plenty to dissipate the heat put out by your MOSFETs. There are also universal MOSFET blocks that will work on a good number of boards, such as this one from Koolance. 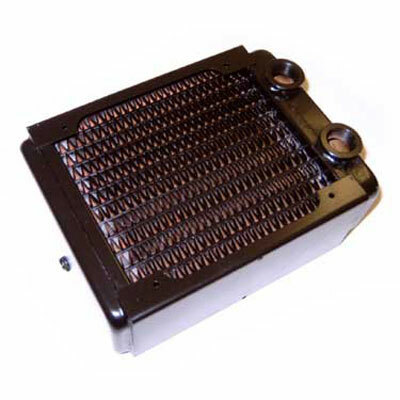 You may need to buy a heat plate to mount on its base for proper contact on all the MOSFETs. Bear in mind, this is nowhere near as “universal” as the NB/SB blocks referenced above. There are quite a few MOSFET configurations on various manufacturer’s boards, some of which will not be able to work with a universal block. For instance, my old Biostar TPower I45’s power section is too wide for any MOSFET block out there. Just measure your MOSFET configuration carefully and order appropriately. Just like NB/SB blocks, there are tailor-made MOSFET blocks available as well. Here is one for an EVGA X58 board. One last note – just remember that chipset blocks and MOSFET blocks especially will increase the overall temperature in your water loop. You can compensate for this with a larger radiator, but the more components you have to cool, the warmer your water will get. With most setups, unless you are pushing very high clocks for long periods, the stock air solution is more than adequate and the addition of these blocks is purely for the ‘bling’ factor. That said, their addition will definitely improve your temperatures and arguably the longevity of your equipment. If you want to use them, those are your options. 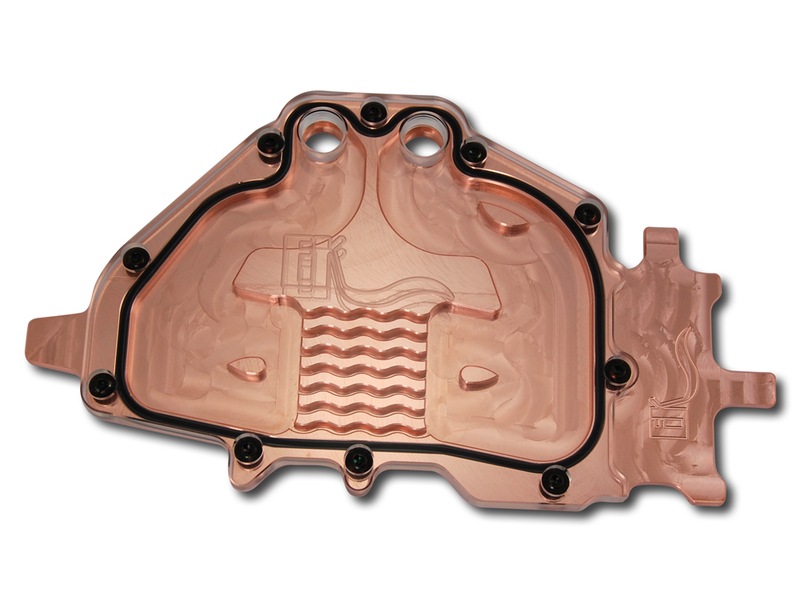 This is the last category of water block we’ll go into. Like chipset & MOSFET blocks, there are two options: the universal block and the full coverage block, customized for your specific GPU. A common GPU block is the Swiftech MCW82. It will fit on a variety of GPUs on the market. If it doesn’t fit, there is always the possibility of an adapter kit to make it fit. Barring that, one can always get inventive with their mounting, though that will take a bit more work. The benefit to a universal GPU block is that it will probably work on other cards when you upgrade. This is great, but as usual, there is a drawback. GPUs are basically little computers, complete with their own processor, RAM, power section & chipset. These other items also need to be cooled. This can be accomplished in a couple of ways, depending on your card. The easiest is to purchase a heat sink for your specific card if there is one, such as this heatsink for ATI 5870 cards. 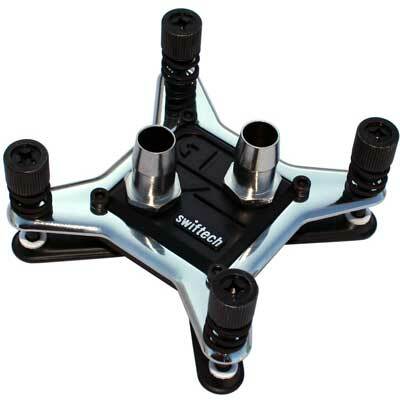 If there is no tailor-made heatsink available, there is always the option of buying the parts separately, using items such as the Swiftech VGA RAMsinks (also used on the chipset and applied via thermal tape) and MOSFET-sinks. If those MOSFET sinks don’t work for your card, you can use the same little individual MOSFET sinks listed previously. Also like motherboard MOSFET cooling, using any of these will require good airflow through your case to keep the rest of the card cool. Since you’ll be air-cooling your RAM, southbridge, board MOSFETs and HDDs anyway, good airflow is already a must and having these air cooled shouldn’t present much additional heat into the case. The other option for GPU water cooling are full coverage water blocks. These blocks look great and cool the entire card, not just the GPU. There are several manufacturers of these types of blocks and several GPU options to choose from; here’s a GTX580 block by EK. The problem with full coverage blocks is that they are not made for all GPUs and even if they are made for your GPU, it generally must be the reference design for it to mount properly. As there are GPU distributors that make their own PCBs, this can be an issue. Always verify the PCB is compatible with the specialized GPU block prior to purchase. This applies to the universal blocks as well; always verify the block will fit before purchasing to save yourself a headache and potentially lost money. When considering a GPU block, also remember that GPUs run pretty hot. Adding one to a single loop will certainly increase the temperature within the loop. To compensate, you’ll either need more radiator (or additional radiators) to dissipate the added heat or you could run multiple loops. The drawback to that of course is you’ll need two of everything. It is certainly feasible to run a CPU, single GPU and chipset in one loop (I’ve done it myself). Just understand your temperatures won’t be as good as if they were completely separate. Provided you get a radiator sufficient to dissipate the heat properly, the temperatures will still be better than air cooling, sometimes significantly. If you want to add multiple GPUs in SLI or Crossfire configurations, MOSFET cooling and/or potentially a SB block to the loop, I’d strongly suggest using multiple loops. Thermochill makes great radiators. They were sold to Watercooling.uk, but from all reports the quality has been maintained. If they continue to retain or improve upon current production techniques, they will continue to be great radiators. XSPC is also an excellent choice. 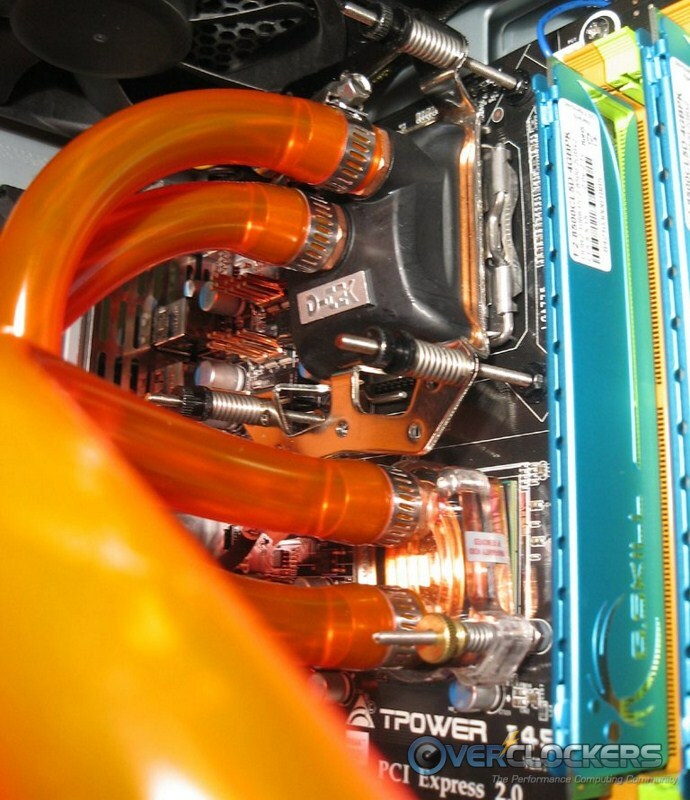 Swiftech radiators are one of the most popular options. Their prices are generally lower than other alternatives. From a price-to-performance standpoint, these are one of the best options. Hardware Labs Black Ice radiators are excellent (their GTX series is the best with very strong fans as a matter of fact), but with the high fin count on most of their radiators, they need more air pressure than most other brands. This means you’ll need higher CFM fans than you otherwise would, which leads to more noise. 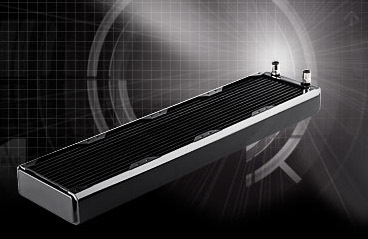 They have also captured the best-of-the-best silent radiator crown with their SR-1 series. Don’t take my word for any of this. Skinnee of Skinnee Labs has completed a roundup of 120.3 radiators and his testing is second to none. So, how much radiator do you need? Well, that depends on what you’re running. If an AMD or P67-based i7 CPU only loop, you could probably get away with a quality 120.1. If you plan on running an Intel i7 CPU on either the X58 or P55 platforms in its own loop, a 120.2 could probably take care of that heatload. Add anything else to either of those setups, and you’ll need more radiator. You may even want more radiator to begin with; these are bare minimums. My personal quick and dirty rule of thumb (and this will probably be disputed) when using high quality radiators (that is important) is to use a 120.1-per-block within reason. So, if you’re running say an AMD 1090T, a chipset block and a single GPU, a quality 120.3 would give you decent temps. Change that to an i7 (non-Sandy Bridge) and you add a significant amount of heat, as they run very hot. I’d give it its own 120.2, so if running an i7, NB block and single GPU, use at least a 120.4. Of course, there is nothing to say you have to use only one radiator. Instead of that 120.4, you could use two 120.2’s or even two 120.3’s. 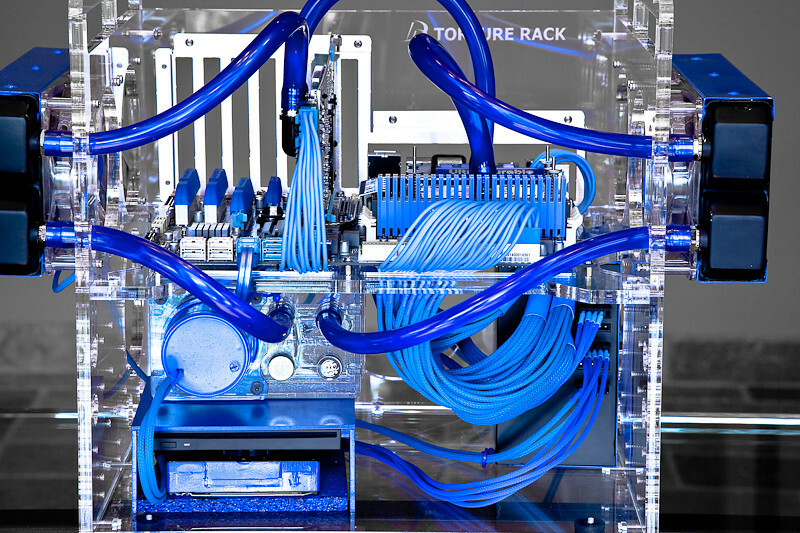 That’s the beauty of water cooling; it’s infinitely customizable! Now, with that said, when it comes to radiators more is always better within reason. To give you better temps with some more breathing room, give yourself an extra 120.1 in addition to that rule. The more the merrier! Just keep in mind that, as with all components, radiators can be restrictive and lessen the flow of water through your system. Most pumps DDC3.2 and better can handle at least two radiators. Any more and you should strongly consider the restrictive properties of your radiator choice. Per this excellent comparison, there can be a large discrepancy in the amount of flow restricted. I won’t delve into the numbers here (this is a beginner’s guide after all), it’s just something to keep in the back of your mind when choosing your radiator(s). I had mentioned silent running before. 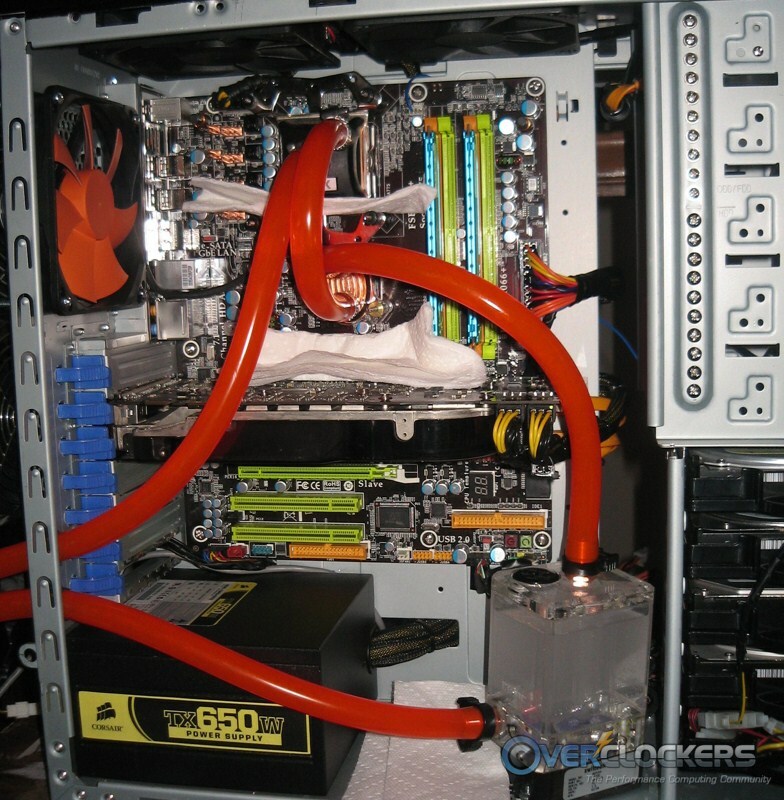 If you plan on water cooling in order to quiet down your computer (a common reason people switch to water, usually second only to temps), you’ll need more radiator. Fans dissipate the heat by blowing cool air across the radiator fins. Generally, the more cool air, the cooler the fins. To maintain relative quiet, fans must run slower, meaning less air is blowing across the fins. To maintain the same cooling capability, you need more fins, which means you need more radiator. What that does NOT mean is that you need more fins per inch. More fin density restricts air flow. To run high fin density radiators, you need strong fans, which are generally louder. To get even BETTER temps, you can run more than one water loop. If running SLI/Crossfire setups, multiple loops are strongly recommended. As long as the GPU(s) is(are) on one loop and the CPU is on another, the rest of the blocks can be dispersed at will. IMHO, the MOSFETs should be on the same loop as the GPUs and the NB/SB should be on that of the CPU. If opting not to run MOSFET blocks and still going with multiple loops, I’d isolate the CPU in its own loop and put the GPU(s) and NB/SB on their own loop. Like I said, infinitely customizable! To make matters even more complicated, you don’t absolutely have to use a radiator designed specifically for water cooling PCs. You can also use heater cores from cars or, if you’re really ambitious, the actual engine radiator from a car. We won’t go into much detail on that here. There are a lot of resources to modify those or even purchase them pre-modded around the ‘net. If you’re interested, just do some searching or ask here in our forums. I’ll only touch on fans, as there are a LOT of them. There are fans for almost every taste. There are high-, medium- and low-speed fans. There are loud and quiet fans. There are expensive and cheap fans. There are fans that combine any number of those qualities with each other. 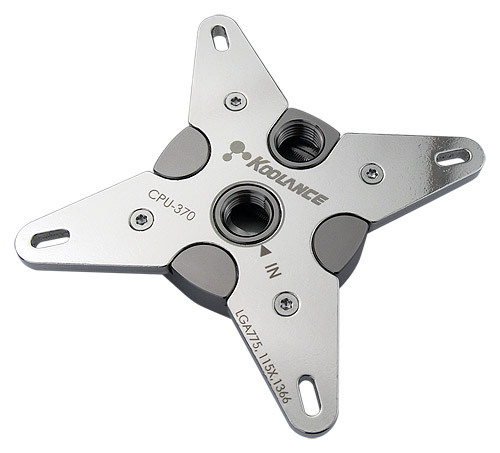 A common fan choice in water cooling are Yate Loon fans,-for their quality relative to their price. There are many fans more expensive that aren’t as good as a Yate Loon. Alternatively, on the other end of the spectrum, you have extremely high quality fans. These tend to cost at least 3x what a comparable Yate Loon does. The generally accepted “best” fans for quality and longevity are Panaflo and Delta. Personally, I use Ultra High Speed Panaflo fans – 114CFM, 2700RPM beasts. It’s overkill and I rarely turn them up, but they are there on my fan controller when I bench and really need them. Do your research on fans, it will serve you well. If you want recommendations, don’t hesitate to ask in our forums. 1/4″ & 5/16″ are all but extinct at this point. There is still equipment available that uses them, but it’s mostly to fix old loops or for the aforementioned and rather pointless RAM blocks. The vast majority of water loops in use on recent systems use 3/8″ or larger tubing. The good part is that your choice of 3/8″, 7/16″ or 1/2″ is not too hard…choose whichever you like! There is very little difference in flow rates, even though there is a relatively large difference in size. An excellent comparison of the difference between the three (and the older two as well) is available here at OCF, if you’re interested. Now that diameter is out of the way, let’s talk quality. Tubing is generally sold by the foot in the US or by the meter outside the US. You can get cheap tubing from your local hardware store for pennies (around $.33/ft for 1/2″ ID) up to the top dollar laboratory-grade Tygon tubing (about $3.99/ft for 1/2″ ID). The difference in tubing quality will be borne out in its routing. The cheap tubing will easily kink when routing it between various components. If there is a lot of room between components for gradual curves, then it will do ok for you. If you are tightly constrained, as most computer cases are, you’re going to want to go with a better selection. Good tubing is very flexible and does not easily kink. If you still have a problem with kinking or anticipate one, you can get anti-kink coils to go around your tubing and assist with that problem. Honestly, I cannot fathom why it is necessary to spend $4/ft on any piece of plastic tubing. Middle-of-the-line but still excellent 7/16″ Primochill Pro LRT tubing is fine with me; here’s a nice example for $2.00/ft. For a cheap but still decent option, I tend to go with Masterkleer 7/16″ tubing. It is not as good as Primochill, but is superb relative to its price at only $.59/ft. 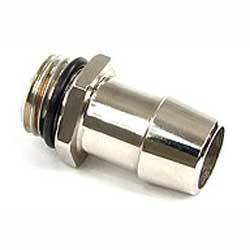 There are lots of fittings out there to choose from for almost any application you could think of. Before getting into that though, let’s talk about what fittings screw into. The industry standard threading is BSPP G1/4″ thread, also denoted “G1/4″ (BSPP stands for British Standard Parallel Pipe). This is referring to the threaded inputs/outputs of your block(s), radiator(s) and reservoir(s). Almost everything uses G1/4 at this point. The only thing you need to be worried about is if something does NOT use G1/4. In that case, you’ll need to investigate what it does use and try to find barbs that accommodate the specific threading. One of the most notable exceptions to the rule are Thermochill radiators, which use BSPP G3/8″ threads. There is also threading denoted BSPT (British Standard Parallel Taper; these use the letter R, i.e. BSPT R1/4”) and NPT (National Pipe Thread Tapered; generally denoted 1/4 NPT). This is just something to keep a watchful eye on; simply peruse specs before purchases and make sure your fittings match the threading on your equipment. Straight Barbs. These are just what they sound like. Straight tubes screwed into your equipment with a barb on the end. You simply push the tubing over the end to install it. Most people use a type of clamp on the end unless they’re very daring. Options include metal worm drive clamps, nylon hose clamps (sometimes called “Herbie clips”) up to Lamptron’s fancy hose clamps. The use of clamps is very highly recommended when using straight barbs. Do not trust that the tubing is tight enough. It will leak eventually. Compression Fittings. These need no clamps because they come with their own. While more expensive, they tend to look a bit nicer and could be considered “easier” due to their install. You slide the screw portion over the tubing, push the tubing onto the fitting and then screw the clamp down straight to the fitting. The drawback is they can be twice as expensive as the standard barbs (and then some). Generally, the majority of users go with barbs because of their reduced cost. If you really want cheap, you can even get molded plastic fittings, but I’d strongly recommend sticking with metal. The drawback to barbs is that most come straight off the water cooling equipment (though there are a few 90 degree barb options out there). Sometimes an angled approach is necessary due to space constraints or to get the look you’re trying to achieve. This can be accomplished by an angled fitting. 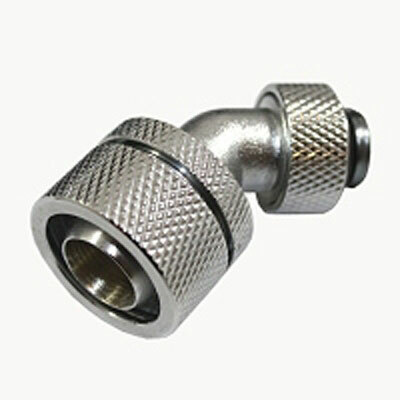 Here’s an example of the best of both worlds – angled rotary compression fitting (the tubing connection is at an angle and the fitting rotates to the direction you need). Here’s a whole page of rotary & compression fittings to give you an idea of just some of the options available to you. Water. It has a higher specific heat capacity than any other common substance (source). That’s why we use it; it’s the best…plus it’s cheap! There are only a couple hard and fast rules that must be followed though. Use distilled water or deionized water; nothing else. Tap water would breed algae and the junk in it would aid in gunking up your parts. I’ve seen it reported that deionized water would pick up stray ions from your parts and lead to corrosion. This is questionable however, considering IBM uses it. A lot of places outside the US have deionized as a cheaper solution than distilled. If it’s what is available, by all means use it without worry. A big difference between deionized and distilled is that deionization only removes the minerals; distilling removes minerals and biological components. I personally use distilled only, but it’s up to you. There is no dispute however that you should never, ever use tap water. Use some type of biocide. One of the most popular options is PT Nuke. There are two versions of PT Nuke. One is for pre-mixed fluids and dyes. The other is for straight distilled water. PT Nuke is simple to use, inexpensive and works very well. Another option is a silver kill coil. Pure silver serves as a biocide without adding anything to the water itself. There are other things you can put in / combine with distilled water. Ethylene glycol (antifreeze) is a common one. I’ve also seen diluted methanol used (windshield washer fluid), though that one is slightly flammable and I’d not use it personally. Ethylene Glycol / Antifreeze is really only necessary in two situations. The first is if you plan on cooling your loop below freezing temperature (i.e. submersing your radiator in cold water and/or putting it outside a window in winter.) The second is for mixed-metal loops. 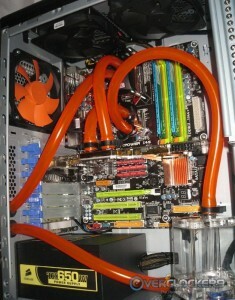 The only mixed-metal loop I ran was with an aluminum-topped GPU block. Due to that, it needed some antifreeze additive. The block was given to me, otherwise I wouldn’t have tried it. Turned out ok though until the 8800GTX was replaced. Quick note on loop components since we’re talking about fuid compensating for it – Don’t use mixed metals in your loop if at all possible as it will lead to corrosion inside your loop. The most common mixture is aluminum with copper. Most blocks are copper but some in the past had aluminum tops. There are also aluminium radiators. The best thing you can do is just stay away from mixing metals, specifically Aluminum. You can mix copper, nickel, brass, silver and gold without issue. What NOT to use, at least in the opinion of most water cooling enthusiasts at Overclockers: dye. Sure, it looks good and can make your liquid glow with a black light. Just look at the gorgeous loops by shazza throughout this guide. Unfortunately, the drawback I’ve seen multiple times is that it will eventually clog up your blocks, causing your temps to go up and causing you to tear your loop down, drain it and clean the inside of your blocks regularly. 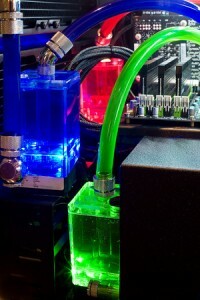 If you want your loop to glow without hassle, get UV-reactive tubing. Stay away from the dye; it does not help temps and will eventually lead to a headache down the road. Same goes with pre-mixed, dyed fluid. That said, if you do decide to use dye for looks, it’s a valid choice; just be prepared for increased maintenance frequency. One last thing and we’re done with fluid. Don’t be fooled by pre-made fluids claiming to be non-conductive. Even if their claim is true, that property will wear off over time and it will become just as conductive as the next fluid. Water, by its very nature, is non-conductive; only when minerals are added does it become conductive, just like “non-conductive” pre-made fluid will. Like I mentioned long ago in the Cases section, planning is essential. Before cutting up your (potentially expensive) tubing, plan how you want to run your loop from start to finish. 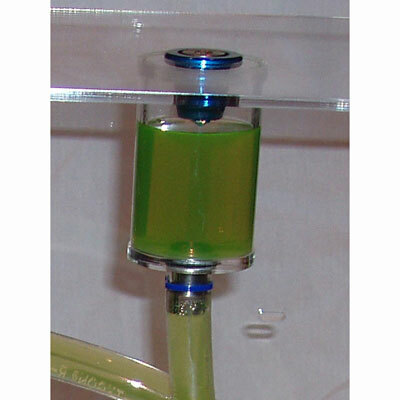 Within reason, tubing length itself will not adversely affect the overall flow of the system. It does affect it though and every little bit counts. Basically, you want the shortest length of tubing from beginning to end for your particular application. If you don’t use any extraneous tubing, you’ll also save money and have some for use later. What is the shortest length? That depends on your setup and what components you’re cooling. Plan, cut and install just enough tubing to get from fitting A to fitting B without any kinking. The only extremely important, non-negotiable rule is to have the reservoir before the pump as stated previously. You must always keep the pump supplied with fluid. Remember: a dry pump is a dead pump. Aside from that, for all intents and purposes, the order of components in a water loop does not matter. When running a water loop, temperatures will equalize throughout the loop with the water temperature determined mostly by the warmest component in your loop. This is perfectly logical. The water will eventually heat up to a certain point due to the warmest component. Once it heats up to that point, it will continue transferring that temperature water indefinitely. The benefit to this is that there are much smaller temperature deltas (the difference between idle and loaded temperatures) with a water loop, barring very high chip voltages. 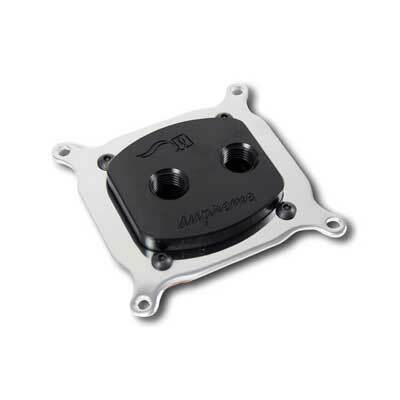 Even with very high chip voltages, the delta will remain smaller than air cooling. So while your idle temperature may be a bit higher if, say, you put a GPU in the same loop as a CPU, the loaded temperatures will be better – and loaded temperatures are the ones that count. Before jumping in with installation, you have some preparation to do. In order to get comfortable with their installation, cut a 3″ piece of tubing and learn how to put it on a barb and clamp it. Better now than when it’s in the PC. Exercise the clamps; open, close them a few times to make them smoother. For barbs, tighten down to finger tight and then use a wrench/pliers to give it 1/4- to 1/2-turn more. Do not over tighten with your wrench; the o-ring can bulge and cause a leak. Radiator preparation is one oft-missed item. Boil sink water and let it cool 5 min. Pour into the radiator, filling it up and let it sit 10 minutes. Drain half of the water or so and shake it till your arms hurt, shaking 3-4 minutes, like a crazy person. Drain into a clear container. Do the “radiator dance” again and again till the water coming out is clear and there is no gunk once the water settles. Then do it two more times. Finally, fill the rad with distilled (or deionized) water and do the rad dance one last time. NOW and only now is your radiator 90% clean. No worries, the last 10% will come out in the next year or two when you redo your loop for maintenance. Inspect your parts. Open the pump and look for gunk / packing material. Run sink water through the blocks, pump and hose. It would probably be a good idea to run distilled/deionized through these as well. Drain as well as you can, but don’t go crazy on draining every last drop. Inspect bottom of block. Don’t forget to remove the plastic cover! Inspect screws and holes, checking to ensure they go together well first. DON’T put a screw through the radiator; I’ve seen this done more times than you’d think. Install the blocks on the parts. Take it slow, even removing them to check TIM contact if you want. Install the tubing. Measure twice, cut once; make it a bit longer if you’re worried, you can always cut it shorter. Dry mount everything, and inspect all clamps etc. Step away for a bit and then inspect it again. After that is done, it’s time to fill the system and test for leaks. DO NOT fill the system and turn the PC on. You want to make darn sure there aren’t any leaks before putting electricity through the parts on which the water loop is mounted. Before proceeding, put paper towels (or the absorbent material of your choice) underneath / around every potential leak point in the loop installed in/onto/near electrical components. This includes not only the tubing and barbs, but the blocks themselves. 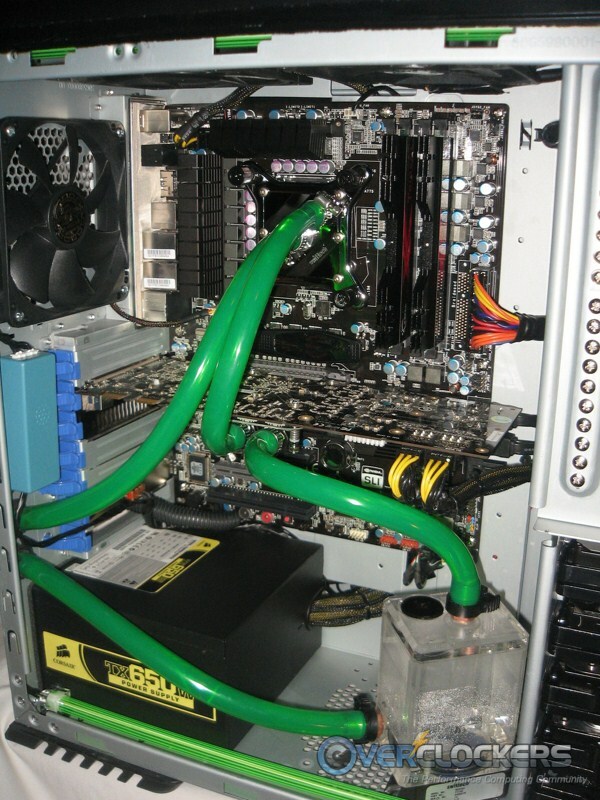 In order to fill the system and test for leaks, you’ll need to either disconnect your power supply from the system or use another PSU to power the pump. I have an older spare PSU that isn’t viable for any modern system but will still put out plenty of power to spin the pump up. To turn a power supply on without having it connected to a PC, simply install a jumper (piece of wire, paperclip; anything that will conduct) between the green and black wires on the 20/24-pin main harness. Here is a pictorial example of how to do it. This may sound intimidating, but it’s really not. The only thing you’ll notice is the PSU fan turning on when you power it on via the main switch on its casing. Now that you have power, turn the PSU off and plug it into your pump. Put fluid into the reservoir / t-line and let it reach the pump. Once you do that, power on the PSU. 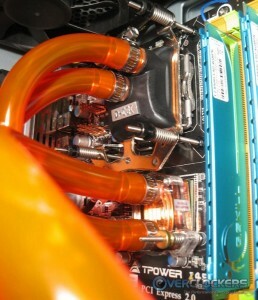 The pump will begin to push the fluid through the loop. When the fluid before the pump is exhausted, turn it off. DO NOT RUN THE PUMP DRY! Fill the res/t-line up again and repeat. Do this until the amount of fluid before the pump remains constant. That indicates the loop is filled. If you get water/liquid all over the place, the parts need to be taken out (meaning Mobo, GPU etc), rinsed in alcohol, lightly scrubbed with a toothbrush, compressed air and if possible blow dried very, very well on LOW heat, then left to dry for at least 24 hours. Pay close attention to the PCI slots, checking to see if they get full of liquid. Compressed air helps a lot to blow them out. As you will surely notice, filling the loop generates a significant amount of bubbles within the loop. These are easily dissipated. Simply let the loop run. The bubbles will be expelled from the liquid when it gets back to your res / t-line. Keep an eye on it for the first little bit as expelling the bubbles will lower the fluid reserve (replacing it with air). You’ll need to top off the fluid at least once, potentially more if you’re using a t-line setup and then once again when all bubbles have been purged. Eventually the liquid will be bubble-free. Generally this occurs sometime within 24 hours. Most bubbles will come out relatively quickly, but there will be stragglers that will work their way out of the loop eventually. Once the vast majority (99.9%) of the bubbles are gone, you’re fine to go ahead and run the loop on the system while the remainder work their way out. 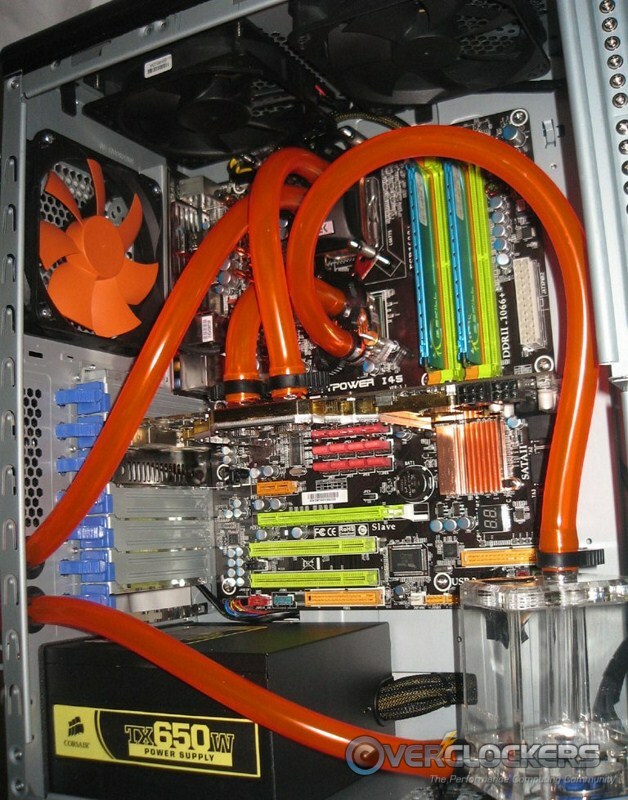 For testing purposes, it is necessary to run the filled loop for enough time to satisfy you there will be no leaks. This varies from person to person. If you’ve made it this far, you’re smart enough to know what is reasonable for you. I’ve heard anywhere from one hour to 24 hours. The way I do it on a fresh system is to install all components the loop attaches to and the loop itself, then fill and run the loop while installing the remainder of the system. Since I’m a wire management freak, this can take a couple hours before the system is ready to power up. If you’re not as thorough or on an existing system, I would run it at least two to three hours before being confident the system is leak-free. Alternatively, you can install the loop at night and run it overnight. In the morning, if there are no wet paper towels, you should be ok to give power to the system and turn it on. Bottom line – be reasonable. Your PC has a lot of expensive electronics in it and water + electricity is not a good combination. Test it for however long you need to feel certain there will be no leaks. When you reach that certainty, congratulations, you now have a water cooled PC! Now that you have a beginning knowledge base, feel free to check out some other resources available here and throughout the web. 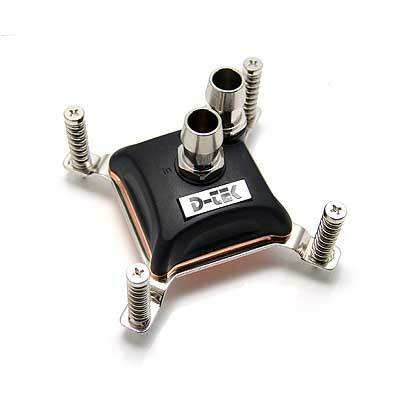 From right here at Overclockers, Conumdrum has written a great Guide to Delta-T in Water Cooling. Conumdrum also gave us a journal of his annual loop teardown and rebuild. Be sure to check out the Water Cooling section of our forum, taking special note of the Ultimate Water Cooling Sticky thread. First on anyone’s list is Skinnee Labs. 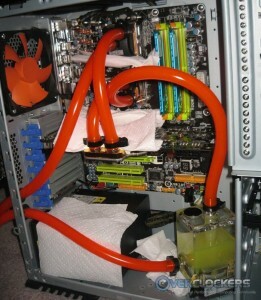 They do the best water cooling equipment testing on the web, bar none. Recently re-joining the ranks of liquid sites, Martin has restarted Martin’s Liquid Lab. You can revisit his superb past testing and articles at the mirror of his former site hosted at i4memory. 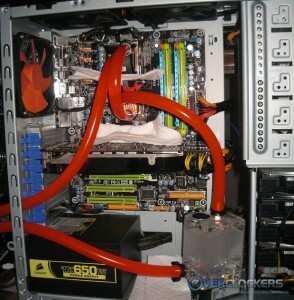 There are lots of places to find water cooling equipment, so we’ll stick to a few that are just here in the US. In addition, most manufacturers allow you to buy directly from their web sites. Sidewinder, Jab-Tech and Petra’s are generally the less-expensive of those five. Every one of them has top notch customer service. Gary from Sidewinder (now also presiding over Petra’s) and John from Jab-Tech are fine gentlemen and treat their customers well. Both Performance-PCs and FrozenCPU trend on the more expensive side, but you also pay for them to have by far the largest inventories of specialized cooling bar none. Both also have good customer service. Truth be told, you can’t go wrong buying from any of these five, it just comes down to personal preference and frugality. Well, that does it. 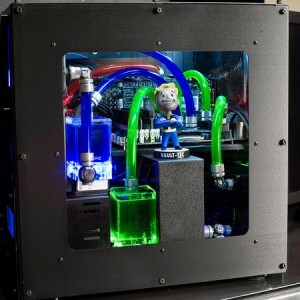 You now should have at least a basic grasp of the components for water cooling a PC and how they should be installed and operated. If you have any questions or suggestions for additions to this guide, feel free to share in the comments! Giving credit where it is due, this guide stems from an earlier version I wrote about two years ago for Overclockers Tech. It has been updated and cleaned up quite a bit for our readers, but that’s where it started. Big thanks to shazza (who is also a moderator at Xtreme Systems) and Ace. for allowing the use of their system photos. Quite a few people gave valuable input to get this thing where it should be. Special thanks to Dostov from The Raptor Pit, Spawn-Inc and Conundrum from OCF, alacheesu, faster3200, W1zzard, Waterlogged and MpG, all from XS and Gilgamesh from Overclockers Tech for their valuable input. long read, but a good one. Nice writeup. To anyone that reads - I was serious about feedback too. If there are items of concern I'm happy to reexamine sections / add if necessary. Only thing that really stuck out in my mind was that you mentioned swiftech a lot when referencing products an had one dead link (the apogee XT testing). You also didn't mention the jingway pump series or talk about the benefits of single vs dual loops (though it was already a PRETTY long guide, so I'm not sure how much you could add)...but that's just me being overly critical. Thank you kindly for the feedback. Fixed the broken link. Re: Swiftech - It just happened to be the easiest place to grab product links when getting examples. That's about it. Re: Jingway - You're right, it didn't make the list. They seemed to be low cost alternatives to the superior DDC/D5 options (just looked at skinnee's testing from last year). There was mention of one of them as just that (low cost alternative) though - the D-Tek DB-1 is a Jingway rebrand AFAIK. Being a basic guide, in most cases people will that go by it will want to start out on one loop. I did mention it, but only in passing because it seems that's more advanced than should be addressed in a beginner guide. Excellent article dude with, all basic things that people need know for switch to WC. 1- Can I suggest add some recommended fans that works in all radiators?, that can help a lot too. 2- What about the maintenance period? 1) I considered it, but there are SO many options out there it would have made an already lengthy guide even longer. Fans are almost the most personal choice and should be chosen to fit a particular person's noise tastes, performance needs and radiator choice. As those are variables that change so much from person to person, I couldn't do the topic justice without going into a lengthy treatise on fans. 2) Excellent point, I'll work on a mention of that when I have time. Quick answer for you - If you have and use dye, no less than every six months. Without it you could go up to a year. IMHO, of course. I only use distiller water with Silver KillCoil in "reservoir", so, I think that one year is fine right? Regarding the reservoir, a good one, not very big, not very expensive and that fit in a HAF X LoL. I think that tube-style vertical is the best option for me. Is there something like the XSPC Res Top for a MCP655, a res that improves your pump? The only reason I got a res was b/c the XSPC Res Top improves my MCP355. Yes, I think you'd be ok for a teardown/rebuild at the one year mark. As far as a reservoir, check out the res page at Sidewinder. Pretty much take your pick out of the stealth res or ek multioption reservoirs. I'm not familiar enough with them to know which has a better anti-cyclone insert though; sorry. That improves the pump? I have no data. But there does exist one at this point for the 655. Found it at Sidewinder last night. the stock top for the d5 is already really good, there are some improvements to be seen with aftermarket tops, but not like with a ddc. @saint - koolance has some nice new tube reses you might wanna check out, EK's are pretty standard, though some have had leaking issues. Thanks guys, I will created a thread for not do this a "personal" thread. Very nice job hokiealumnus! 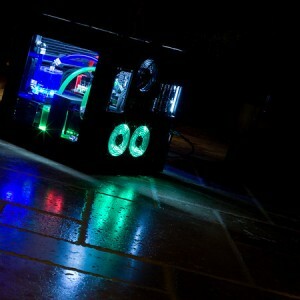 Some great pictures too, I'm jealous of such clean setups. 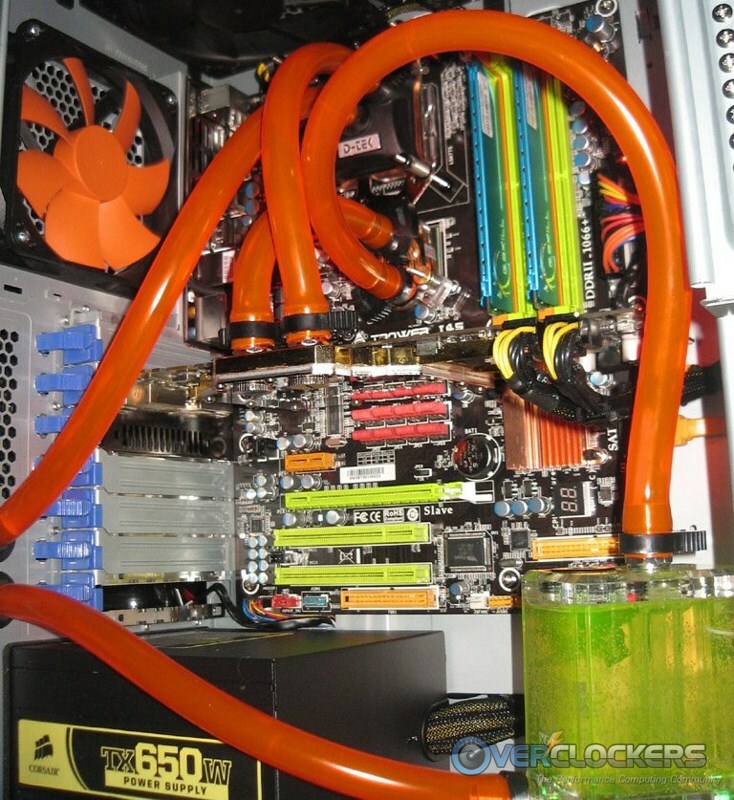 I got started water cooling back in the days Bill Adams was around and he got me interested. After various stepping stones, I've ended up with an alternate water cooling setup that works very well but really isn't economical so I wouldn't seriously suggest it to others. I progressed from radiators to a chiller. The chiller of course isn't an economical approach but hanging around eBay for weeks finally yielded one at a "reasonable" price. I can run a higher overclock and still keep the CPU very cool. At this point, I've ended up with an external enclosure for the pump etc. Makes work in the computer easier but gota admit my setup is Rube-goldberg. Me? Well, I succumbed to the benching gods and my loop has since devolved into this for ease of transfer/portability. 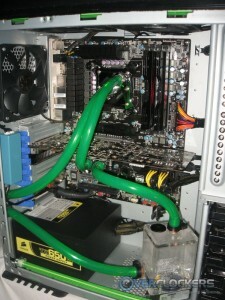 The Lian Li now houses an air cooled system. .... I succumbed to the benching gods and my loop has since devolved into this for ease of transfer/portability. I was really hoping this link Hokie just wrote would stay at the TOP of the current posts, in BIG BIG red BLING letters, and not buried in the sticky link. We know how little peeps start there. They spend 20 min typing the first question that are so easily answered by spending 20 minutes reading. Saves ALL of us time and effort..